The ‘Why Europe Matters’ survey explores young Europeans’ views about Europe and the EU, their education and employment, and their hopes and expectations for the future. This web-based survey was conducted by the Eastern Norway Research Institute. It was opened on 1 September 2017 and closed on 31 December 2017. Part of the survey focused on young people’s concerns and expectations for a better Europe. Respondents were asked to indicate how strongly they felt about the most important challenges for national governments and the EU to address. Quality education (at 88%) came top with security/terrorism (80%) and youth employment (78%) not far behind. Climate change (68%) is in the top 4. These 3 top concerns are rather independent of age, gender, rural/urban, entrepreneurship education, or geography. One notices though a slightly higher concern about security/terrorism and youth employment in Eastern and Southern Europe. The survey also aimed at identifying young people’s attitude to the European Union and their plans or expectations for the future. It is striking to note that young people want to know more about the EU; they feel their voice is not heard. 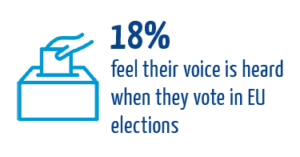 Only 18% felt they were heard in EU elections. At the same time, 66% believed that young people need to hear more about the EU from their teachers. Exploring now the benefits of the EU, young people were asked what was the most important benefit of the European citizenship. In terms of geographical differences, we observed that the Euro (common currency) is seen as less important in the Eastern region (45% say it is (very) important), compared to the South (65%), and Northern / Western regions (65%). Young people know about the major benefits of the EU, but to what extent do they feel aware of the European developments? We note different levels of knowledge/ awareness towards the EU among those who said they had participated in entrepreneurship education and those who had not. Young people with entrepreneurship education experiences seem to have a higher level of knowledge about the EU. Young people who have participated in entrepreneurship education are also more likely to discuss the EU with their families and friends than others. We note differences of opinion and attitude towards the future among those who said they had participated in entrepreneurship education and those who had not. Young people with entrepreneurship education experience are more optimistic about the future. A majority of young people reported that they would like to start their own business. Still, 65.5% of those with EE experience against 49% without are eager to become entrepreneurs. Most respondents agree that it will be harder to find a job in 2030 but young people with EE experience are more positive about an increased quality of life for people in Europe and in their own country. 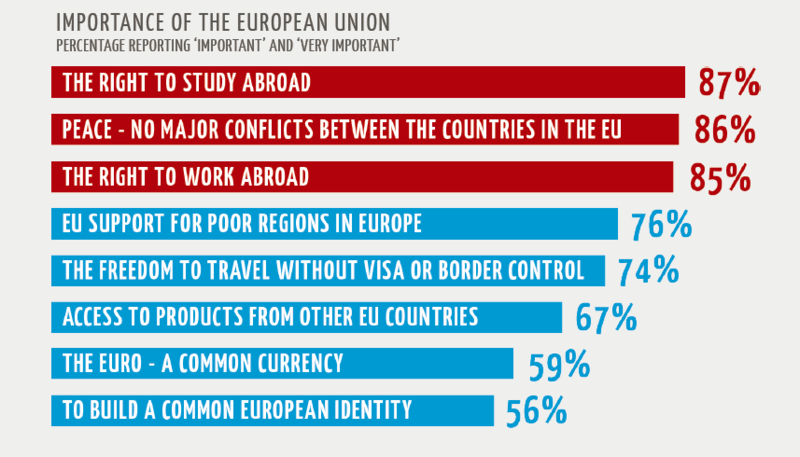 Young people with EE also seem to better grasp the advantages of the European integration, as they tend to be more willing to work abroad for instance.